Spreadsheet data can be sorted in DataLoad. This functionality can be accessed by selecting the Tools->Data->Sort menu entry. The window shown below will appear and the required sort criteria may then be defined. When this has been done the OK button should be pressed to start the sort. 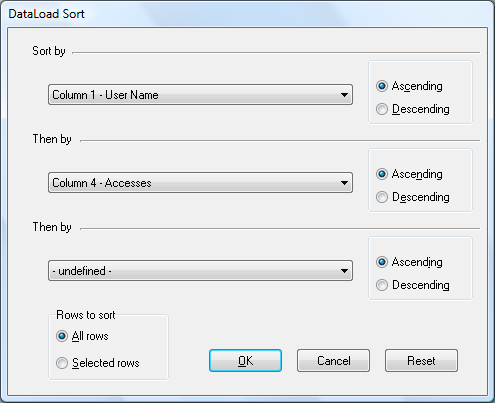 DataLoad uses the Quicksort algorithm to maximise sorting performance and large volumes of data can be quickly sorted. The sort can be performed on up to three spreadsheet columns. Where more than one column is specified the sort is performed on the first column and the second column is used where values in the first column are identical. Similarly, if a third column is included then the sort uses that data where values in the second column are identical. The name(s) of the column(s) to be used for the sort are selected from the drop lists and these will contain the column numbers, i.e. Column 1, Column2, etc, and, where defined, the column titles. The screen shot below shows a sort on columns 1 and 4 and those columns' titles are "User Name" and "Accesses" respectively. Alongside each column drop list are radio buttons that are used to specify whether each column should be sorted in ascending or descending order. The sort may be performed on the entire spreadsheet or on only the currently selected rows. The latter option allows just a subset of the spreadsheet's data to be sorted. Whether the entire spreadsheet is sorted or not depends on the value of the "Rows to sort" radio button.